The G/L Interface module allows the user to run a procedure to export monthly depreciation to an output file sorted and totaled by G/L Code for both Debit and Credit. 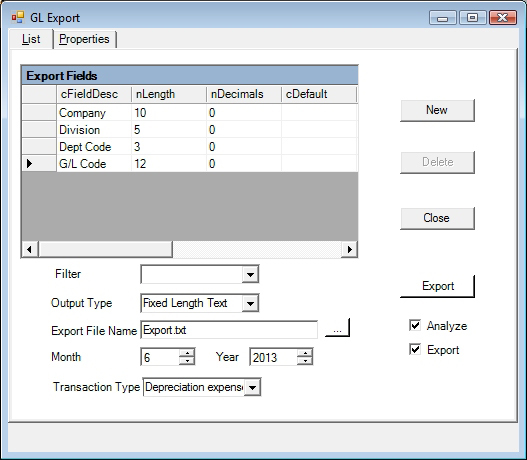 The G/L Interface enables the user to select the data fields to export, define the type of file they want to export to, and the month they would like to run the export for. To define the output file, the user would select the necessary data fields in the order required. For each data field, the user can set the length, number of decimals and/or default value. Once all the fields have been properly defined, you may proceed with the export.